In Baha'i faith, education is of utmost importance. So it makes sense that Shakib Zabihian, a Baha'i programmer who fled religious persecution in Iran in 2013, is behind an education startup in his new home of Los Angeles. Zabihian is the co-founder of Toot, a startup that launched a nationwide text message-based tutoring service on Thursday. For the past year, Toot has operated in the Los Angeles area as an on-demand tutoring service: Using the Toot app, students can hire a tutor for an in-person or digital sessions. But now, Toot is expanding its footprint -- and making it even more convenient for students to seek help via text. For now, the text tutoring is only available for certain subjects: Math, science, physics and statistics. To sign up, anyone can text 424-292-TOOT; a Toot bot will ask a few questions in order to figure out which tutor to assign. The service taps 2,000 vetted tutors around the country with various subject specializations. Many Toot tutors are teachers or professors, and they can help with concepts ranging from elementary to college-level. For a short period, Toot is charging $40 a month -- or 50 cents per minute -- for 24/7 access to a tutor (the rate will likely go up to $80 a month in the future). It's a passion for Zabihian, 25, for whom education hasn't come easily. Baha'i members are prohibited from getting higher education in the Islamic country of Iran, so Zabihian had to attend an underground university called Baha'i Institute for Higher Education. The school has been raided on several occasions, he said, with some of his professors and classmates jailed as a result. "Students go through so much, traveling to Tehran every month from remote places, attending classes all day long without a break ... knowing that you will not get a degree at the end [and] you may unjustly be arrested at any moment. And [they] still do it. All of this has made me passionate about education," Zabihian told CNNTech. To leave Iran, Zabihian was smuggled through to Turkey, where he lived for 16 months before seeking asylum in the U.S. These days, he's going to college part-time at Santa Monica College in addition to serving as chief technology officer at Toot. Even teaching himself to program required clearing hurdles to access education materials. At age 13, Zabihian wanted to help his father build a website -- but he found there are few programming books available in Farsi. Instead, he taught himself English so he could read available materials. And at 17, he secured a part-time programming job. 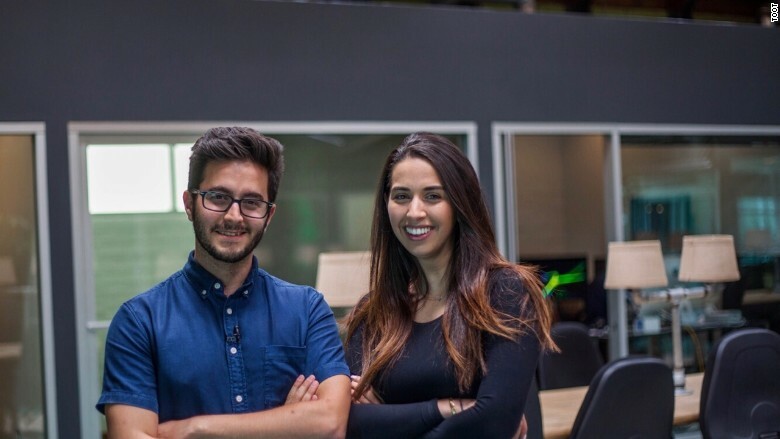 Zabihian met Toot CEO and cofounder Sophia Parsa through a mutual friend in January 2015, and the pair has been working on Toot together since. Toot started out as a company trying to solve the "tutoring problem," said Parsa, 25, told CNNTech. But she realized the issue at hand was much broader: "The truth is, there's not a tutoring problem: There's an education problem." Students have long relied on resources like traditional tutoring, or even Google, to understand assignments and concepts, Parsa explained. But there's no feedback loop with these methods: Teachers don't know what types of questions students are asking or the specific concepts that are more difficult to grasp. Toot's goal is to provide is a learning experience, Parsa explained. Tutors don't merely provide the answers; they help students work through the problems and thought process, diminishing the risk of using Toot to cheat on an exam. The startup has raised $500,000 in funding from big-name investors like the Getty family, Hyperloop CMO Kim Salzer and "Spiderman" actor Tobey Maguire. Toot hopes eventually to work with school systems, leveraging its data about the types of questions students are asking so schools can better customize their curriculum to students' learning needs. Additionally, Parsa noted, these insights could be helpful to textbook authors and publishers: Toot could share which concepts are more opaque for students and how they might be better explained. "We're in this digital age when students prefer to talk over text than in real life," she said. "We are recognizing the way that students are learning."